Since the release of in-skill purchasing (ISP), I’ve been working on a new game skill that was worthy of selling premium content. My goal is to deliver a great voice experience for free, while adding premium content that my passionate customers would want even more. As I continue working on this skill, I’ve learned a lot about building with ISP, from how to optimize my upsell experience to how to enhance my ISP metadata to how to test my ISP for a great customer experience. Here I share three ways you can create your own skills with ISPs using the Alexa Skills Kit Command-Line Interface (ASK CLI), and two great skill-building tools from Storyline and Voice Apps. We released the Skill Management API earlier this year, and it is a robust set of APIs that you can use to create, manage, and maintain your Alexa skills. This includes actions like retrieving the interaction model for a skill, submitting a skill for certification, or even simulating a skill for testing. It is because of SMAPI that additional tool developers have emerged, making it even easier for anyone to build skills. Tool builders VoiceApps and Storyline have recently launched support for in-skill purchases as well. With these tools, you can create new Alexa skills in your browser without a heavy reliance on software development knowledge. The ASK Command-Line Interface (CLI) is an amazing tool for developing and deploying Alexa skills. It was built directly on top of SMAPI to make it easy to work with skills from the command line. You can write all of your code locally, in your favorite IDE, and use the CLI to manage and push your code to the appropriate locations when you’re ready. Before ISPs were released, I built most of my Alexa skills using the Alexa Developer Portal and the AWS console. Since then, I’ve realized just how fast I can build and deploy a skill with the CLI. It is definitely a more advanced approach to skill development, but the flexibility and speed are unmatched. By creating an ISP file and deploying it as part of your skill, you are instantly able to offer and sell products in your skill once it has been certified. This is a great approach for developers that want to work locally, prefer to use their own tools, and are familiar with a command-line interface. Storyline makes it easy to create Alexa skills without writing code. Using Storyline's simple visual interface and ready-to-use templates, non-technical content creators can get started with building flash briefings and custom skills in minutes. 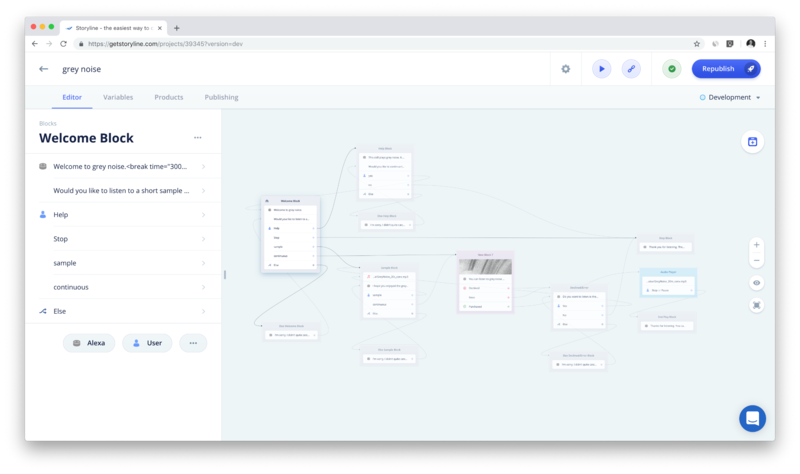 Storyline offers advanced features like version management, integrations, content scheduling, and allows playing your skill right in the browser to test how it "feels." Storyline already powers more than 3,600 skills in the Alexa Skills Store. 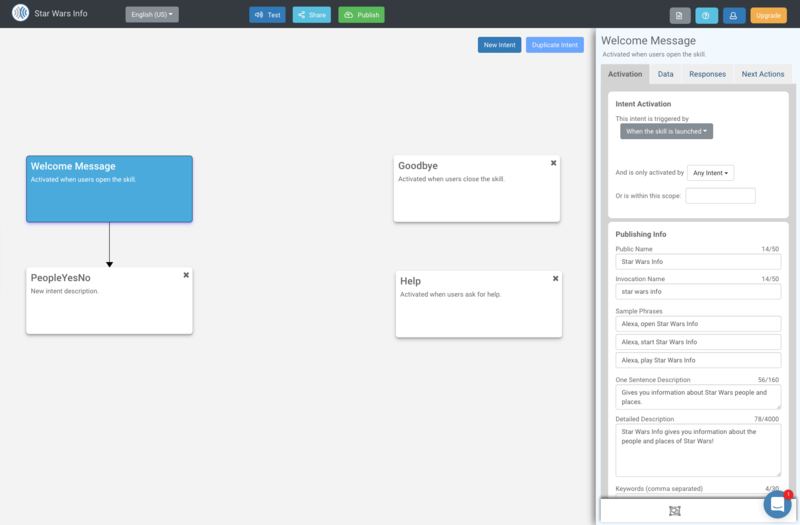 Learn more about adding in-skill products with Storyline. VoiceApps.com is a visual, drag-and-drop tool that lets anyone—regardless of their background—build and publish Alexa skills. The freemium version extracts most of the complexities of building and deploying skills and provides access to even advanced Alexa skill capabilities. VoiceApps.com offers dozens of ready-made templates to help you get started. Users can even monetize the skills they build with VoiceApps.com by adding in-skill purchasing, directly within the tool. Learn more about adding in-skill products with VoiceApps.com. With both of these tools, you now have many different options to create engaging skills and make money by offering in-skill products through one-time purchases, consumables, and subscriptions. I can’t wait to see what you’re going to build with ISP. Reach out to me on Twitter @jeffblankenburg to share your story. You can make money for eligible skills that drive some of the highest customer engagement with Alexa Developer Rewards. You can also make money with Alexa skills using in-skill purchasing or Amazon Pay for Alexa Skills. Download our introductory guide to learn more.